The USA has ignored demands by the current Zambian regime to retract a statement issued by the White House that China is holding Zambia at ransom using bribes and it is about to take over national assets. 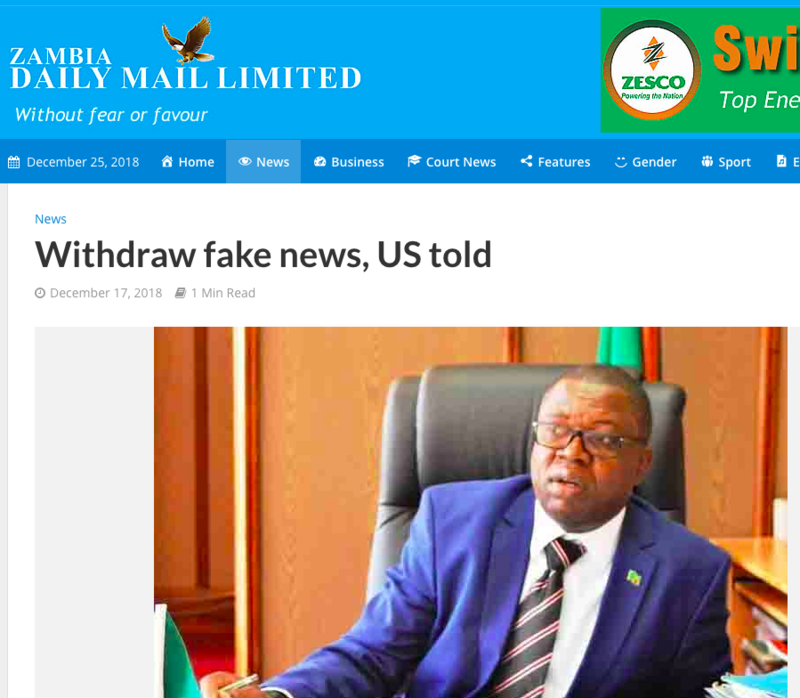 This angered the Zambia regime which sent angry letters to the USA government accusing that country of fabricating and spreading fake news on Zambia. Minister of Foreign Affairs Joseph Malanji told the world that he had written a de’marche to the United States. He said he had ordered the USA embassy in Zambia to send his demand letter to the White house immediately. But the Watchdog has been informed that the USA has ignored the demands and so far no retraction or apology has been made. Diplomatic sources tell the Watchdog that the USA did not take kindly to this insolence by the Zambian regime. Our assistance to Zambia’s health sector also includes Ebola preparedness, fighting malaria, and protecting maternal and child health. The U.S. President’s Malaria Initiative has invested $30 million, working hand-in-hand with the National Malaria Elimination Center to reduce the burden of malaria on Zambians throughout the country. In November, Zambia and the United States concluded a five-year, $355 million Millennium Challenge Corporation compact that will benefit 1.2 million Lusaka residents for many years to come. I value the relationship between our nations’ armed forces and the role it plays in advancing regional peace and security. Since 2015, the U.S. government has provided peacekeeping training in support of the Zambian Defense Forces’ participation in the United Nations Peacekeeping Operation in the Central African Republic. We proudly support the fifth Zambian battalion now preparing to deploy, thus continuing Zambia’s immense contributions to peacekeeping efforts within the region. I want to highlight that U.S. assistance comes at no financial cost to the Zambian people and does not saddle the government with excessive debts. We issue grants, not loans. This means Zambia does not have to repay the United States. We make such investments in order to strengthen Zambia’s ability to achieve inclusive economic prosperity for all, and to protect, develop, and care for its most important resource—its people —as well as advance peace and security not only in Zambia but throughout the region.